Check out new articles from ABPMP International and our partners. You can also review the Community Calendar for more upcoming events. ABPMP International provides certifications that can help you stand out professionally in the BPM world. Our certifications are unique in our rapidly changing market place and have been developed by and for BPM practitioners. They are designed to comply with international certification standards and are now the internationally recognized standards for BPM professionals. The first level, Certified Business Process Associate (CBPA®), is for individuals who may be fairly new to the business transformation profession. The CBPA® certificate is focused on the new BPM practitioner. The exam demonstrates the credential holder’s understanding of business process improvement and transformation concepts across the disciplines covered by the BPM Common Body of Knowledge(BPM-CBOK®). The second level, Certified Business Process Professional (CBPP®), is designed to differentiate expert practitioners from others by proving that they have the competency skill levels and experience needed to succeed in improving or transforming business operations. Practitioners who sit for the CBPP® exam are expected to have a high level of hands-on expertise in these areas. The exam is for experienced professionals who have a minimum of four years of practical on the job experience on BPM projects. By being a professional paid member of ABPMP International, you will get access to our online community, the current version of the BPM-CBOK® and discounts on the CBPA and the CBPP exams. Paid members are also eligible to re-certify by only paying $75 and completing and logging 60 hours of continuing professional education activities. If you have any questions about this new payment option, please feel free to contact the ABPMP international office by email at membership@abpmp.org or call 850-474-0995. These are Europe’s only co-located conferences on Enterprise Architecture and BPM. This event provides a unique opportunity to discover the latest approaches and innovative ideas to both Enterprise Architecture and BPM and benefit from the synergies between them. Choose to attend 1, 2, 3 or 4 days of the event. Delegates can attend sessions at both conferences. The event includes a track devoted to Business Architecture. Designed by Practitioners for Practitioners. Being neither analyst nor vendor-led, the conferences provide diverse and wide-ranging perspectives on Enterprise Architecture, BPM and Business Architecture, informed by practical experience. Get Value for Money. Choose from more than 70 sessions, with 2 tracks on Enterprise Architecture, 2 tracks on BPM and 1 track exclusively on Business Architecture. Whether you are just getting started or looking for more advanced knowledge you will find sessions that address issues you are facing and people who can advise you. Conference Workshops. Choose from an unparalleled range of workshops on specific topics to get you quickly up-to-speed or fine tune your performance on the first and the last day of the event. These are Europe’s only co-located conferences on Enterprise Architecture and BPM and provide you with a unique opportunity to discover the latest approaches and innovative ideas to EA, BPM and Business Architecture and benefit from the synergies between them. This conference provides an unparalleled networking opportunity for Enterprise Architects, BPM Professionals and Business Architects from across Europe and beyond. The Conferences are Designed by Practitioners for Practitioners. The conferences are therefore centred on first hand stories on EA, BPM and Business Architecture in practice. And, by focusing on the people who know EA, BPM and Business Architecture best – the Practitioners themselves - they are always an excellent reality-check on where EA, BPM and Business Architecture are today, and where they are going to next. Focus on End-User Case Studies. Take an inside look at the success and challenges behind real-world Enterprise Architecture, BPM and Business Architecture implementations. Case studies and contributors include: Shell, Prudential, Bayer, Centrica, Zurich Insurance, Southern Scottish Electric, European Investment Bank, Capita Transformation, Reckitt Benckiser Group, Canada Life, Orange Poland, NFU Mutual, PFA Pension, Kuwait Oil Company, Yorkshire Building Society, Crown Prosecution Service, Capgemini Norway, Henley Business School, Cambridge Assessment, KCOM, City of Malmö Sweden, Lørenskog Municipality Norway, Victoria Public Services, Tatra Banka, Jordão Cooling Systems, McKinsey & Company, National Treasury Management Agency, HU University of Applied Science Utrech, Vesta Corporation. Five Conference Tracks Focusing on Company Case Studies. Choose from more than 70 sessions, with 2 tracks on Enterprise Architecture, 2 tracks on BPM and 1 track on Business Architecture. Whether you are just getting started or looking for more advanced knowledge you will find sessions that address issues you are facing and people who can advise you. Conference Workshops. Choose from twelve pre-conference workshops and four post conference workshops on specific topics to get you quickly up-to-speed or fine tune your performance. The Business Analysis Conference Europe 2017 provides an unparalleled networking opportunity for Business Analysts from across Europe and beyond. Whether you are just starting your BA journey, you are an experienced BA or you would like to understand the role of BAs further, this conference is for you. 70 Senior Transformation and Operational Excellence Executives will be attending on June 27-29, 2017 at the Wyndham Grand Chicago Riverfront to discover new ideas on how to create a clear road-map to sustainable and agile business transformation and operational excellence. ABPMP is partnering with the OPEX Exchange, which enables members who are Senior Operational & Process Excellence and Business Transformation executives a discount, providing you qualify to attend. As organizations turn to new digital tools to achieve better standards of work and increased efficiency, the challenges of transforming culture and mindset are becoming ever larger. Creating a clear roadmap to operational excellence and business transformation that navigates today’s unprecedented operational and economic pressures is a huge challenge. Download our 2016 post event report to see what the likes of Honeywell, J.P. Morgan and Walmart see as their biggest challenges over the coming year and what areas they're looking to invest in. By attending the Exchange, you can network with senior peers and gain valuable cross-industry knowledge. You'll also have the opportunity to meet with innovative solution providers. Commerce Bank, Kellogg's, AON, University of Iowa Hospitals & Clinics, BMO Harris Bank, Optum Health, State Street, Jackson Health Systems, Discover Financial, T. Rowe Price, MetLife, Walgreens and The Home Depot are all already confirmed to attend to share their experiences and knowledge - request your invite here. Bizagi, Co-Creation Partners, Covius, Drive Inc., IBM, Lateetud, McKinsey & Company, Microsoft, OpusWorks, Systems Alliance and Wilson Perumal & Company are some of the companies that will be sponsoring the Exchange - if you provide solutions to any of the challenges from the post event report and would be interested in helping our attendees, let me know here. Download the agenda here to find out the topics that will be discussed and to see if your organization’s aims and challenges align. Europe's only forum on Innovation, Business Change and Technology is a unique setting to explore and debate the vital connections between innovation, investment, organizational and personal change, business transformation and leveraging technology. Discover new ideas, approaches and solutions, while learning first-hand from the experiences and successes of organisations such as Shell International, Airbus Defence and Space, HM Courts & Tribunals Service, Associated British Foods, Aviva Health, Royal Mail Fleet, Yorkshire Building Society, Erste Group Bank, Aviva, Euroconsumers, Port of Antwerp Authority and Reed Exhibitions. ABPMP Members Get a 10% Discount! Use this discount code to register online! ABPMP has partnered with OpEx Week: Business Transformation Global Summit (January 23-27, 2017, Orlando, Florida). We wanted to share some of the most popular articles trending in operational excellence globally at the moment. 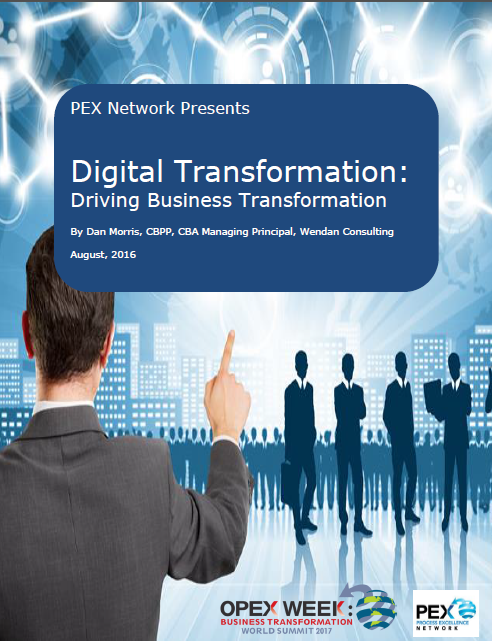 These articles have been very popular and have been described as the most informative, insightful and strategic relevance by your peers already attending OpEx Week: Business Transformation Global Summit. And they’re available for free to download… Enjoy! See what the big deal is about going digital? Discover more about the reality of digitaldisruption, dealing with this disruption requires larger IT staffs and often results in a need to operate with expensive manual work-arounds. What does becoming a Digital Enterprise mean to you and your company? 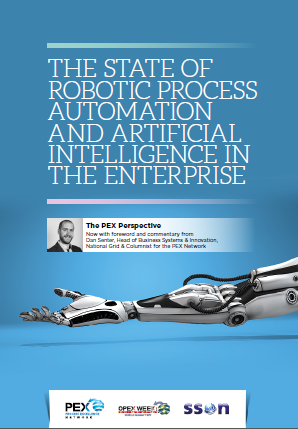 How RPA and AI fit against the backdrop of investment in global operational excellence? ABPMP has also agreed a limited number of special rate passes on your behalf as one of our members. ABPMP members have access to a promotion code for a 20% discount off the full conference fee. Use the promotion code to register online! 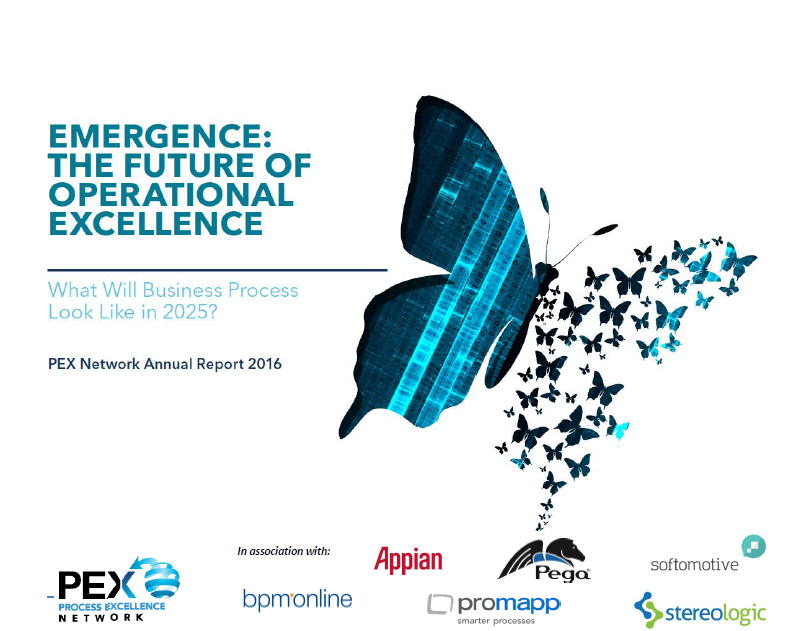 OpEx Week: Business Transformation World Summit 2017 will be the most progressive and most innovative year yet: a whole event dedicated to all the elements that you need in order to deliver business transformation, performance and operational excellence. Join us there to find out more about the unique opportunities (and challenges) that exist in RPA, AI, Operational Excellence, Business Transformation and more with the industry's leaders. Benefit from OPEX Week Thanksgiving discount and save $950 on your pass for OPEX Week by booking online before November 23.